Inoh Tadataka (1745-1818) was a surveyor and a cartographer who created the first map of Japan based on actual surveys he himself led. 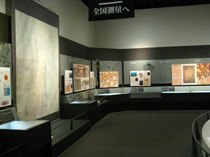 The Inoh Tadataka Museum exhibits the life and achievements of Tadataka in chronological order and presents in exhaustive detail his monumental feat, the Inoh Maps. 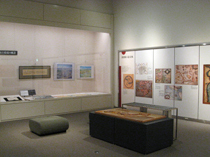 He had devoted himself to his family business— which is running a sake brewery— and to the public duties as the headman and the guardian of officials of Sawara Village (present-day Katori City) officials before he left for Edo (present-day Tokyo) at the age of 50. At 34, he journeyed purely as a pilgrim to Matsushima（外部サイト） to visit famous Buddhist temples and Shinto shrines. 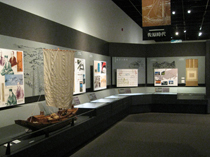 At 48, when he traveled to the Ise Grand Shrine（外部サイト）, he surveyed latitudes and azimuths. He had apparently taken a strong interest in astronomy and almanac since then. In Edo, he became a disciple of Yoshitoki Takahashi (1764–1804), a Shogunate official who was in charge of calendar construction and astronomy. After studying Western astronomy and related fields at 55, he performed his first　actual survey along the southern coast of Hokkaido. From then on, he accomplished ten actual surveys by walking and measuring distances across the country until he reached the age of 71. 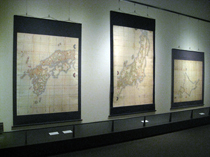 Three years after his death, the map of Japan was completed. 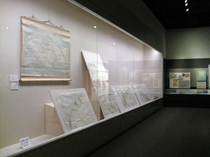 The maps he created are collectively called “the Inoh Maps,” consisting of “the Dai Nihon Enkai Yochi Zenzu” or “the Maps of Japanese Coastal Areas” (214 sheets of a large 1:36,000 scale map, 8 sheets of a medium 1:216,000 scale map and 3 sheets of a small 1:432,000 scale map), which was completed in 1821, as well as other various maps created in each survey, including maps of famous scenic spots. 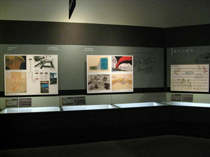 Based on his actual measurements, these maps are not only exceptionally accurate but also artistic. 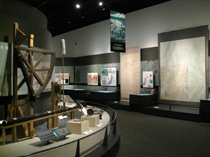 *The exhibits including the Inoh Maps (National Treasures) and the surveying instruments are switched bimonthly. 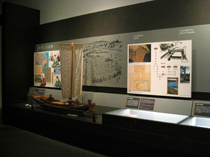 How did Europeans visualize Japan before Tadataka accurately presented the map of Japan in the 19th century? 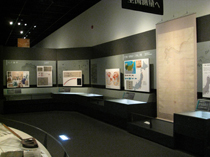 The map of Japan, a country in the Far East, had been drawn by Europeans on the basis of various speculations and obscure geographic information. 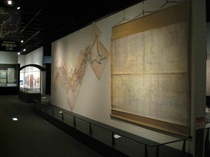 How, then, had the Japanese imagines their own country before the Inoh Maps? 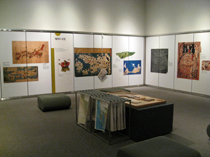 Viewing maps provides you an enjoyable experience. 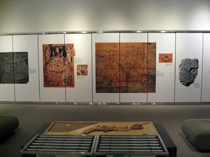 Through their forms, you can trace the influence of the period during which they were made, as well as the religious outlook and the purpose of producing them.